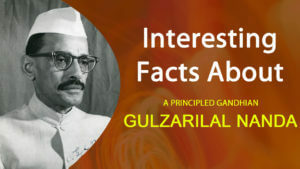 Gulzarilal Nanda, a simple and honest Indian, was born at Sialkot in undivided Punjab on July 4, 1998. His father was a school teacher. Nanda did his post-graduation in economics from the Allahabad University and then passed his LI.B. in 1921 and became a staunch trade unionist. He came in contact with Mahatma Gandhi around this time and joined the non-co-operation movement launched by Gandhiji, When the movement was called off, Nanda joined the National College at Mumbai as Professor of Economics. Moved by the plight of the industrial workers, Nanda took active part in trade union activities and was elected secretary of the National Trade Textile Association in 1922. Overwhelmed by patriotism, he joined the civil disobedience movement launched by Gandhiji in 1930 and was imprisoned in 1932. For his participation in the ‘Quit India’ movement, Nanda was imprisoned for two years. In 1960, Nehru recalled him to the Planning Commission as its Deputy Chairman, a post he held till 1963. In 1964, after the death of Jawaharlal Nehru, Gulzarilal Nanda served as acting Prime Minister for 16 days only till Lal Bahadur Shastri took over the Prime Ministership. After the sudden demise of Lal Bahadur Shastri in 1966, Nanda again took over as acting Prime Minister; this time only for 14 days till Indira Gandhi took over as Prime Minister. 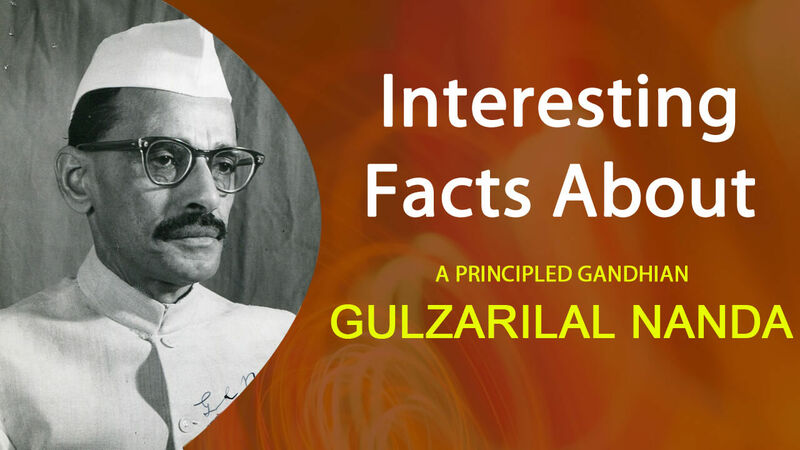 Gulzarilal Nanda was the Home Minister in Indira Gandhi’s cabinet but had to resign from this post due to certain controversies. In 1970 he was Minister for Railways for a short while. As Minister of Railways, Nanda tried to make life for travelling public more comfortable. He took a number of measures to see that efficiency was introduced in running the Railways. He tried to work for higher earnings, reduction in expenditure, and employment of surplus staff. Special attention was paid to upgrading passenger amenities like drinking water, better sanitation facilities etc. Nanda spent a major portion of his life fighting corruption in all walks of life. He believes that the temptation of corruption originated in social demands, costly habits, artificial pomp and show. With regard to bribe, he felt that the bribe giver was as responsible for the offence as the bribe taker. He felt that if people who were charged with administration and development activities could work with honesty and zeal, it would be helpful in curbing corruption in the country. He tried to reform the administrative system to make it a fit instrument for giving justice to the people and for elimination of anti-social activities. Nanda retired from active politics in 1972. During his lifetime, he did not own any property. He had lived in a rented house in New Delhi’s Defence Colony from which he was evicted since he could not pay its rent. Gulzarilal Nanda had no source of income and would not accept monetary help from his children or friends. However, one of his friends, Sheel Bhadrayajee compelled him to sign an application for freedom fighters’ pension of Rs.500/- per month. July 24, 1997 was a day of great pride for Dr. Pushpa Naik and the whole of Ahmedabad when Gulzarilal Nanda was awarded the greatest civilian award of India, the “Bharat Ratna”. Due to ill health, Gulzarilal Nanda could not accept the award personally, but a lot of friends; well wishers and trade union leaders came to congratulate him. This principled Gandhian, freedom fighter and trade unionist, who believed in simple living and high thinking, died on January 15, 1998, a little before his hundredth birthday.